Amazon topped the list for the second year in a row with $22.6B spent on R&D and Google's Alphabet parent company was second with $16.2B. Samsung retained fourth with $15.3B in R&D spending, followed by Intel with $13.1B, Microsoft with $12.3B and Apple with $11.6B. 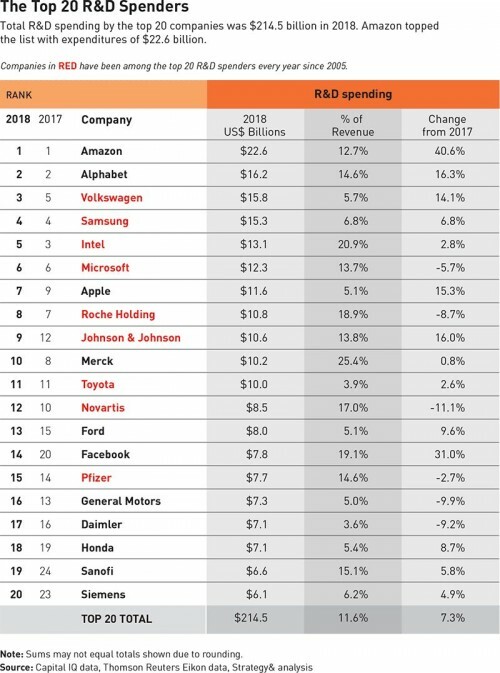 The top 1000 public companies spend a whopping $782B in R&D in 2018 - an increase of 11.4% over 2017. Computing and Electronics and Software and Internet were among the highest spending industries in the world, only trailing Healthcare. Facebook has increased its R&D spending by 31% to $7.8B. Among tech companies Amazon saw the highest growth of R&D spending compared to 2017 - an increase of 40.6%.